1935 "Murray Steelcraft" Mail Plane by Kiddie Car Classics. A limited edition of 29,500 pieces issued in 1996 exclusively for Hallmark. 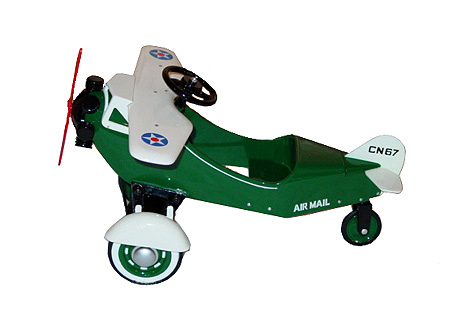 This LONG-RETIRED US Mail Airplane Pedal Car miniature is made of chunky die-cast metal, and is BEAUTIFULLY painted, complete with "US Mail" markings. Miniature pedal car measures 8" long. Also features a working steering wheel, and even the propeller moves about...all that is needed are your own motorific sound effects as you push it about the house. Rrrrrrrrrrrrrrrr!!! It is MINT CONDITION in the original box, never displayed. We have only two of these in stock.